This is the first day for visiting London. First thing would be going to Buckingham Palace, which is close to Victoria station - from which we arrive to London -, to check if the changing of the guard is performed this day or the next and, after visiting the place, we will walk through St. James Park to Thames River. 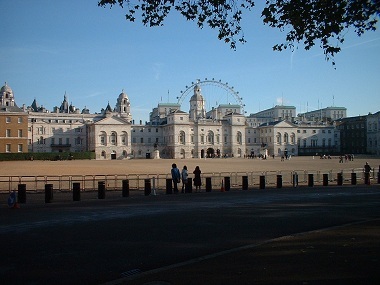 Depending on if the changing of the guard has happened or not we can go to explore Westminster area, with Abbey and Parliament building, with its famous Big Ben, or going directly to Trafalgar Square. After lunching, darkness will prevent us for more visits outside, so we will go to British Museum. I wake up very early leaving my family sleeping peacefully and I’m leaving the hotel parking with the car at 6:30 AM, still at dark night. I’ve brought a paper with the words I wrote from my phone conversation as a code to reach my destination. Without leaving the Purley Way I hated so much yesterday I get into M23 highway. I pass by the Gatwick airport exit until finding the exit to Crawley, which is one of the words in my paper. Left, one roundabout, another roundabout and left again and Hotel Copthorne! I can’t believe it! I’m here!! I still need to wait for a bit and then I deliver the car with no issues. They take me to Gatwick airport in a crowded car as they’re taking advantage of this trip to going to breakfast. There I can take the train to East Croydon, which is just the next station from Gatwick. I’m very happy of getting free from the car. When I leave the train station I go to the tourism office it’s just here and ask about Travelcard. It’s 21.20£ by the one for three days, off peak and 6 zones. I take maps from the area and take bus 119 which I’ve been told is the one going to our hotel. When I arrive I find my family enjoying the breakfast buffet and I join to them. They’ve already found someone in the staff speaking Spanish for asking anything. As I have the experience from this same morning we can reach the train station quickly by taking bus 119. Before entering to the station we go to the tourism office and purchase four travelcards – which could make us save the 2£ of the bus we just came with – and take the train to Victoria Station. We identify it easily as it is displayed in the platform. With all this, we’re in the center of London at 11:45 AM. We do the short walk to Buckingham Palace to find out the changing of the guard is tomorrow because of the few people being here and a notice at palace’s doors. Although we will come back here tomorrow, it will be very crowded, so we take our pictures in the area now with the palace, its big golden grilled doors and the monument in the middle of the square in front of it: Queen Victoria memorial. We, Eva and I, already knew this place, but these places don’t lose their charm. I haven’t found anywhere the typical guard in front of his box set there for the people can try to upset him as he stands with no move. Well, I’m sure they’re there for something else, but this is what we saw in movies. Somehow, the only guards around are far beyond the closed doors. We leave the place for going on with our walk through the closest park there: St. James Park. It is a small park, but very beautiful. It is full of fauna and flora. We’re surrounded by doves and squirrels and herons, gooses, ducks, swans and some other species of water birds are approaching to us. None of these animals are shy and live close to the people passing by as I’ve never seen anywhere else. We love this place! A bridge over the river crossing this park lets having nice views of the buildings at both sides of the park. This park ends in the guard house, where maybe we will find the famous guards standing in their boxes. Downing Street is close too, which famous number 10 is the residence of Prime Minister of the country, but it is obviously close for people access. When we’re walking across the large sand area of the guard house I understand this is not the house for all the guard, but the horse guard. We walk through a pass way they have for crossing to Parliament St. and there are tourists waiting for their turn for posing with the two guards on a horse being here. They try to don’t move themselves and the horses but when it’s my turn I don’t know why the horse feels curiosity about me and start exploring my body with its head. It’s funny as it hasn’t moved with anybody else before. In the other side we meet the well-known London: red phone boxes, red double decked buses and the Parliament building at the end of the street. We’re in Westminster and here we can already see Big Ben, which is in improvements works too. It is upsetting me every time we meet a remarkable place there are scaffolds on it. This specific one is not covering the tower but the roof from which it rises. 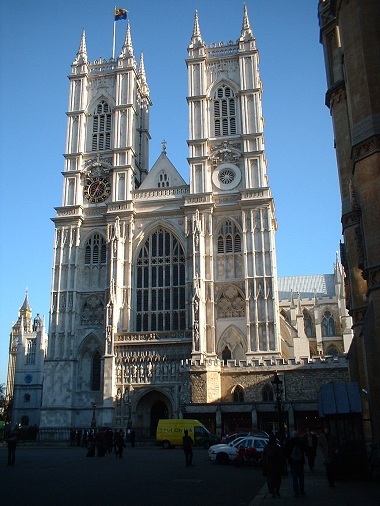 We first go to Westminster Abbey to admire its beautiful frontal façade, so different of the cathedrals we know. It has a clock in the left tower which breaks this hyper meticulous symmetry. We don’t go in because it is expensive and we don’t have 2x1 coupons for this place. Then we pass by the parliament building to get Westminster Bridge for having, as we’re crossing it, the best views of parliament and London Eye, the modern and huge wheel was set here. Sky is cloudy, don’t be fooled by the two pictures with a blue sky as they’re from our visit in November of 2005. Once at the other riverside it’s 2 PM, so our visits for this morning have taken two hours and now it’s time for looking a place for lunching. There are a lot of restaurants around here, but we take the first lonely street we see looking for less touristic rates. This is the Belvedere Road and there are two restaurants here: the first one is an empty Italian and the second a Chinese. We go to the Italian one as we agree with the prices shown. It’s name is Locale. We take two big plates of pasta for us and two salads for my parents, with a couple of “antipasti” to share by less than 40£ in total. It’s not expensive and portions were big, so we’ve chosen the right place. When leaving at 3:30 PM the sun is hiding and we keep walking by the riverside, passing by the London Eye, which is really tall, and by some areas with walls full of graffiti, until reaching Waterloo underground station. 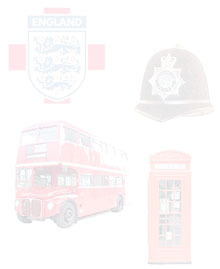 The black line (Northern) take us in just four stops to Tottenham Court, the closest station to the British Museum. It’s 4:30 PM when it’s dark and we get into the museum, so we’ve got one hour for this visit. We explore the Great Court and the halls around it, with a library full of old books and items in display here and there. Then I see my wife looking at Rosetta stone and scratching with her nails the letters on it for checking if they can be removed and I panic. “For God’s sake! What are you doing? This is the Rosetta stone, brought by Napoleon and…”. She just say it cannot be the real one, here where everybody can touch it and I think she may be right. Obviously it is not the real one. The rest of the hour we explore the Egyptian area in the upper level, along with the Persian and Mesopotamia ones. We’ve gone directly to the mummies as that is what we’ve came to see. My mother loves everything here and seems to want taking the whole museum to home in pictures. One day we will take her to Egypt but, in the meantime, this is a good preview. We leave at museum closing time, 5:30 PM. The subway takes us to Victoria Station where the train takes us back to Croydon. When is dark this early it always seems later than the real time. I’m feeling like eating pizza so I take one in the Pizza Hut near the hotel. This is the only thing we do as we go soon to our rooms for a well-deserved rest.